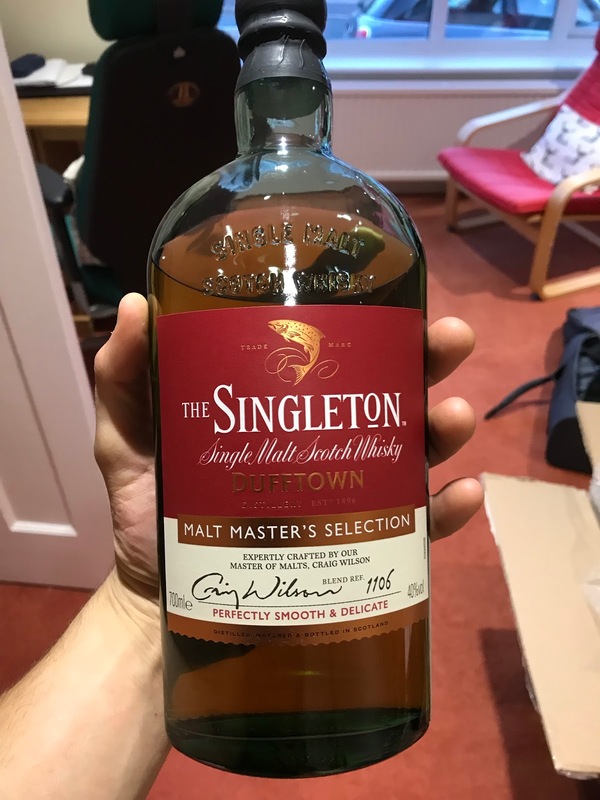 I only realised the other day, when looking through the sidebar on my blog, that I haven’t reviewed a whisky from Dufftown distillery yet, which is crazy because my first bottle of single malt whisky I bought was Singleton of Dufftown 12. Its never been a particularly impressive or well regarded distillery though and the attempts of Diageo to make something of it as a single malt seem to have fallen a little flat. They tried age statements, then they tried no age statements with cool names and now they have a new one that just sounds the same as everything else on the market. I’ve tried three from these different eras. Nose: Fruity Speyside, lots of stewed apple, sweet pear, pastry, hot fruit crumble, apple pie, apple juice, some nut, some malty chocolate, cream. Taste: Fruit and nut. Soft and mellow. Nutty, malty arrival, fruity development- Soft apple, pear, lots of vanilla, some honey, little bit of spice. Finish: Short length. Fades gently with... well nothing really. My 1st single malt whisky! Mental that I hadn’t reviewed this before. Quite thin and average at times, especially into the finish. Nose: Fresh, strawberry, sweet fudge, sweet toffee, raspberry and meringue, pavlova, clotted cream. Taste: Soft, 'smooth,' sweet toffee, fudge, biscuit, vanilla then creamy with strawberry vodka? !, some young spirity notes into the finish. Finish: Short/Medium length. Strawberry vodka, spirity. A bit different with those obvious fruity strawberry notes but it ends up being artificial and thin again. Almost tastes more like a grain whisky actually. Nose: Malty, pear, marzipan and red apple. A little praline shell chocolate, but fairly classic Speyside. Vanilla and pastry after a bit. Taste: Soft, vanilla, creamy, red apple, some ginger, some oak, apple juice, then malt and some generic chocolate. Finish: Short length. Lacking power then more malty with chocolate again. Another young one I think. Shows off more of a natural style though.